I wonder how plastics will perform long term in vacuum. This might be OK for short exposure of a few days, but there are at least three factors to consider. - Loss of plasticiser. The plasticisers that prevent plastics becoming brittle are volatile. They are slowly lost even at atmospheric pressure so plastics become more brittle with age. This process might be much faster in a vacuum. - Effects of high and low temperatures. Plastics weaken at high temperature and become brittle at low temperature, for use in space it would be essential for them to be maintained near room temperature. - Effects of radiation. Space is full of radiation. It would be easy to protect from visible and UV wavelengths but what about X-rays, cosmic rays etc? Plastics suffer radiation damage. Third stage will be in space for at most a few hours. Its job is to drop off the payload and deorbit itself. Are you thinking of using a carbon fiber sleeve over the center section for strength and then maybe covering the entire apparatus with beta cloth to deal with heating issues? It might be as simple as that to negate the major issues. I don't know if true, premade COTS bottles are really going to work. 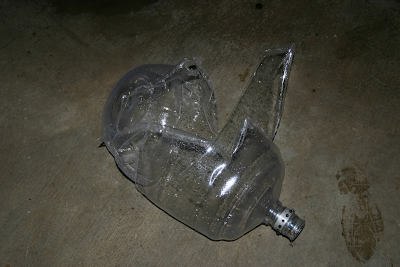 It might take going a custom shape (thicker middle) in a PET bottle former using COTS preforms. how COTS would it be to get say a 10L preform and have it used to make a 5L bottle? Thicker bottle walls might lower the initial MR but perhaps it gives you enough pressure so you don't need to add anything else. 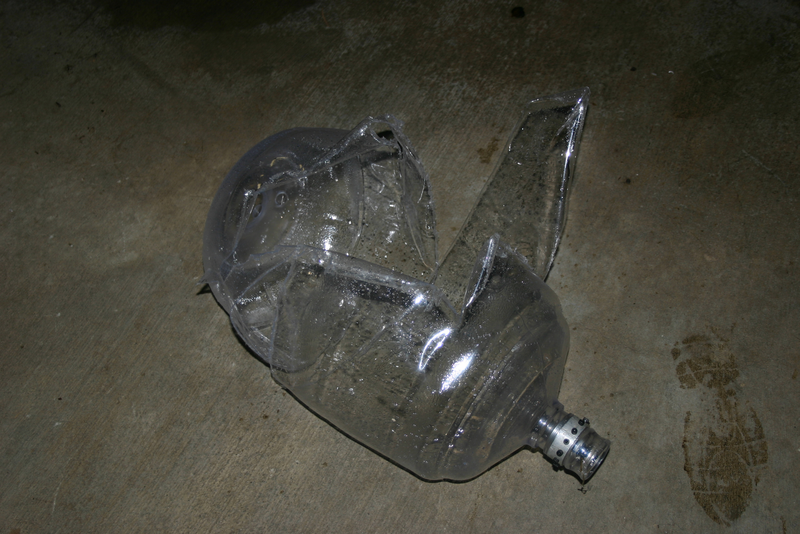 After you started talking PET bottles I went and dig some light googling - looks like you can get a forming machine and maybe make your own shapes from the preforms. Not easy COTS, but an interesting idea if you wanted it in production quantities. Why 'Hi-Tech' carbon fiber? What about wrapping it with a layer or three of fiberglass? Raw carbon fiber is not expensive in the context of ANY flying rocket vehicle. If your going to the trouble to do a wrap use the best materials. How did you get such a good seal on the bottle? I machined an aluminum fitting with o-ring grove, the inside of the bottle neck was very smooth and uniform in diameter. I then stuck it on the rotary table and drilled and tapped 12 8-32 retainer screws. Then I made a backing plate to go on the outside and drilled that, then split it on the band saw so it would go over the neck below a support lip. I used the backing plate to drill holes in the neck above the level of the o-ring seal. You can see all of this on the two pictures I took. After I burst the tank I cut off the neck above my fitting and that weighed 33 gms, so a little bit more weight can come out. I did not weigh my fitting as it was crude and quick, and not flight weight. All in all the described fitting fabrication took two lathe setups and two mill setups and about 2 hours total. Both the lath and MILL are cnc, but for something this simple its quicker to just type the G-code directly into the machine. Doing a drawing and CAD model would take loner. I am curious how the bottle responds when it has 3-5G's applied to it. The strain would rupture the container. 11309 lbs length wise and at least double that in the other direction. It won't notice the payload if its pressurized at all. It's like the original Atlas that was pressurized. would exceed the 125 psi burst strength by over 50%. from deforming the same as the sidewalls of a tire ,but this will not increase the burst strength. Silver plate the entire damn engine. Float a bladder in the tank. Fill it with H2O2. Surround it with vinyl chloride gas- the 25*C pressure is twice that of propane, no more. There's the pressure. No cryo, and the Delta V is about 40% better than LOX/Kerosene. ASt 8lbs/gal times 5 g * 5 gal we have 200 lbs, so 14,000 from pressure makes the 200 from content trivial. The forces generated with pressure are way beyond what your intuition says. ACME Disys was established in the year 2002. Today it shares the trust of leading Pet preform dies manufacturing companies. Acme boasts of being the leading Pet Blow Mold and Pet molds Manufacturer from India with over 300 proven moulds installed globally including100 plus systems in 48 cavitations. 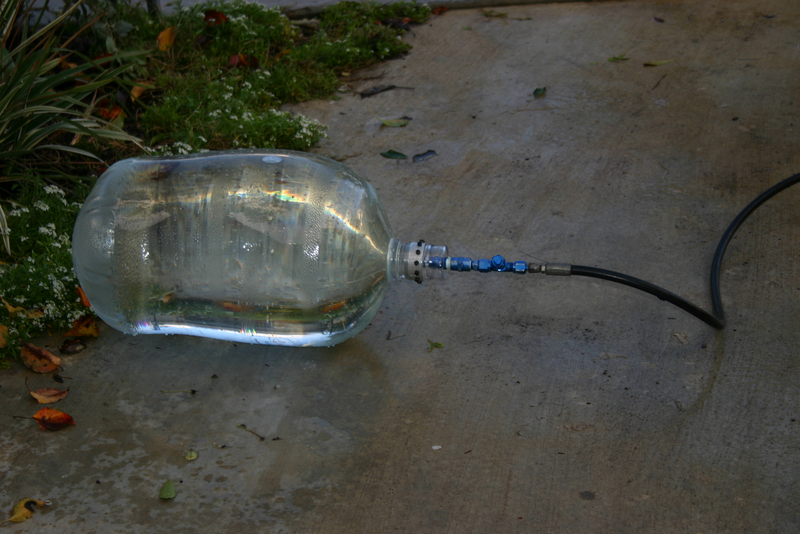 Forgive me if i misinterpret the 'During' photo, but is that a gas line going to a bottle half full of water? If so then please beware - it's /really/ dangerous to do hydrostatic burst testing with a gas phase present. Please save yourself the injury and do any future burst testing with water (or another incompressible fluid) only. 125psi = approx 140psi absolute, so there is 140/14.7 = x9.5 gas expansion at burst - you might get away with only cuts if a broken piece hits you. If you are angling for a 1000psi burst pressure on the wrapped tank that's x69 gas expansion ratio at burst - probably enough to kill, or at least send bits of broken bottle flying a considerable distance!! SINO-PK.com is a professional PET preform molds manufacturer in China, manufacturing PET preform molds for over 20 years. Annually, we made more than 600 sets of various preform molds such like 5 gallon preform mold, wide mouth preform mould.